We just finalized the legal stuff for Crystallize together with the brilliant team at Bull, what a great name for a legal firm btw. We wanted to have a friendly and balanced terms of service to reflect our philosophy and customer focus. Slack, which we think are awesome, sat the bar at about 5900 words. 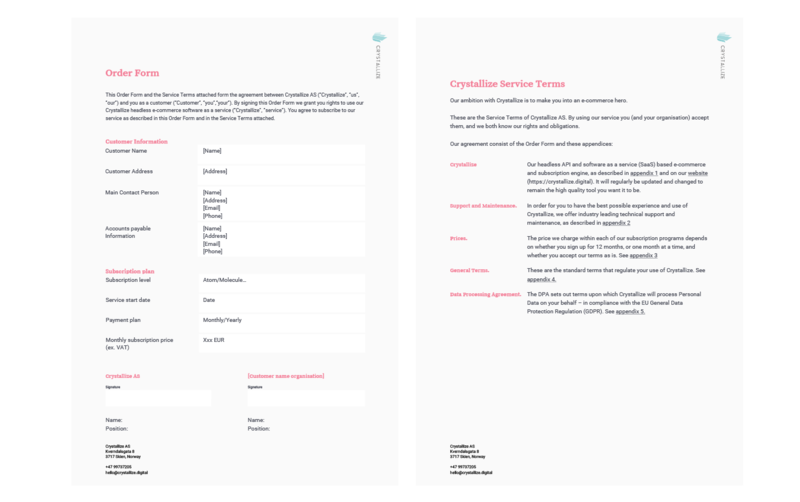 The Crystallize terms of service counts today 2272 words which is just 38,5% of what the great team at Slack has, and that is including the order form. We have with our previous ventures been stuck many times in negotiations over legal framework for the software. Delaying the project and also our payday months after a purchase decision has been made. The reason is often rooted in software companies trying to create an unbalanced legal framework which more in their favor than the client’s. We wanted to take a different approach where we try to simplify the legal documents with the drivers: a friendly tone of voice, easily understandable vocabulary and keeping it as short as possible. This is customer friendly and also in the end saves time on legal work again saving cost and time; a classic win - win. The online references are versioned and following best legal practice combined with openness and transparency. I guess this was a first: a blog post on a great new legal framework. You can check it out and feel free to be inspired with your own legal documents, that is in our combined interested. Simplify and clarify.